Notice is hereby given that Masters of all vessels carrying dangerous goods when entering, leaving or lying in the Port of Cowes will be required to comply with these regulations. 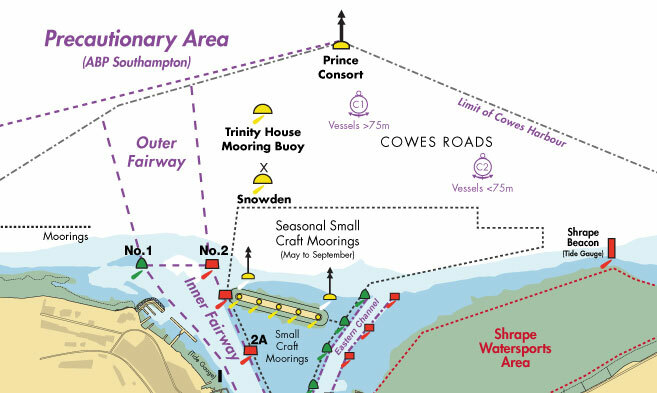 These regulations apply in every Harbour and Harbour Area and to any part of a Harbour in the territorial waters of Great Britain. “Dangerous goods” means goods or cargoes, whether packaged or in bulk, which meet the criteria in the IMDG Code for classification as dangerous goods and as further described in Part 1, regulation 5.2. An advance notification of dangerous substances arriving by sea into Cowes Harbour will be required by the Harbour Authority from Masters of vessels or their Agents and must be received at least 24 hours prior to the arrival of the vessel in the port, in accordance with Part 2, regulation 6. It should be noted that tankers having carried one or more cargoes and which have not been rendered gas free, purged or cargo spaces completely inerted will also be required to provide the advance notification. of Wight, PO31 7AS in writing via e-mail (chc@cowes.co.uk). • Where a voyage is of less than 24 hours duration a shorter period of notice may be accepted, minimum 12 hours before arrival with notification direct to office or via shipping agents whether in writing or by other means that can enable acknowledgement of receipt of such information. • Name and call sign of vessel. • Overall length, draught and beam of vessel. • Intended destination within the harbour area. • ETA Prince Consort Buoy. • Last port of call. • Constitute a hazard to persons or property on land or in the vicinity of the harbour. • Correct technical name of dangerous substance. • Quantity of each substance. • Details of the number and type of packages to be individually handled (where appropriate) including the carrying unit type; e.g. vehicle, container etc. Vessels carrying dangerous substances to which these Regulations apply are required to show a red flag during the daytime and at night or in restricted visibility, an all-round red light. A Master shall not bring his vessel alongside a moored or anchored vessel which is displaying any flag or light required as above without the permission of the Harbour Authority and the Master of that vessel and shall otherwise keep his vessel at a safe distance from that vessel at all times. The Master of a vessel to which these Regulations apply shall ensure that at all times when within the Port of Cowes, as defined on Admiralty Chart No 2793, a listening watch is kept on VHF Channel 69 (VHF Channel 69, Cowes Harbour Working Channel) except when a vessel is at a berth or for short periods when the radio is tuned to another frequency for operational purposes. The Master of a vessel which is carrying dangerous goods, or on board which any dangerous goods are to be loaded, shall anchor or moor his vessel only at such places and at such times as the Harbour Authority directs and shall ensure that any conditions the Harbour Authority may impose with regard to anchoring or mooring are complied with. The Master shall not permit his ship to be moved from an anchorage or berth until he is authorised to do so by the Harbour Authority. The Master of a vessel carrying dangerous goods must ensure that his vessel is in a state of readiness to be moved at all times, tidal conditions permitting, and shall not immobilise his vessel without first seeking an exemption certificate in writing from the Harbour Authority. Any such exemption may be granted subject to conditions and to a limit of time and may be revoked at any time by a certificate in writing. Vessels carrying Class 1 Dangerous Substances (Explosives) will not be given an exemption. The Master of a vessel which is designed to carry either dangerous chemicals in bulk or liquefied gases in bulk shall not carry, load or unload any dangerous liquid or dangerous substance in bulk in Cowes Harbour, unless the vessel has a valid certificate of fitness for the carriage of the substance in bulk issued under the authority of the Government of the country of registration of the vessel and he complies with any conditions of carriage laid down in that certificate. The Master of a vessel carrying a liquid dangerous substance in bulk shall not cause or permit that substance to be transferred by pipeline to another vessel unless the Harbour Authority and, where the vessel is at a berth, the berth operator, have given their permission in writing for that transfer to take place. • The discharge from the vessel's tanks or ballast or slops contaminated with any dangerous substances. • The cleaning or ventilation of any tank that was last used to carry a dangerous substance. • The pumping over side of bilges contaminated with any dangerous substance. • The gas freeing of any tank which was last used to carry the substance. • The cleaning of such a tank with water, steam, detergents or other chemicals. • The purging of such a tank with inert gas. • Where a vessel is at a berth; the berth operator has given his permission or the Harbour Authority has given their permission. • Where the vessel is not at berth the Harbour Authority have given their permission. Cowes Harbour Commission has an emergency plan in place for dealing with emergencies which may arise and which involve, affect or could affect dangerous goods that are brought into or are handled in the harbour area. The Master of a vessel carrying a dangerous substance shall immediately inform the Harbour Authority and if the vessel is at a berth the berth operator of any untoward incident which occurs or has occurred on the vessel. 'Untoward incident' means an incident involving or threatening the containment of dangerous goods inside a harbour area, which might create in the harbour area a serious risk to the health and safety of any person or a risk to the safety of a vessel. Vessel operators, owners or agents are reminded that under Part 5, regulation 15 - No person is to carry or handle explosives within a harbour area, or load or unload any explosive in circumstances to which this regulation applies by virtue of regulation 14(1), unless the appropriate authority has issued a license permitting such activity and there is full compliance with any conditions of that license. In all cases the Harbour Authority must be consulted in order that appropriate licensing can be applied for.